Find information here on getting a library card, paying fines, and using library computers. Getting your first library card is free for all ages! To sign up, visit any branch and present a piece of identification or official document that has your name and current address on it. Please notify us of any changes in your personal information, as it is your responsibility to keep your contact information current. Sign out up to 50 in-house items (including books, DVDs, audiobooks, etc.). Download up to 10 eBooks and eAudiobooks, and unlimited eMagazines. Note: downloadable eBooks, eAudiobooks, and eMagazines do not count against your 50 item limit. Free computer and internet access in any branch. Free access to subscription databases and other on-line resources with authoritative, full-text articles. Access to children's and adult programs for all ages from story times to workshops. The following chart indicates the fines and fees charged on late materials. * = Renew in person, by phone at 905-623-7322 x2712, or through the library catalogue. Items cannot be renewed if requested by another person. You are responsible for the items borrowed on your card until it is reported missing. 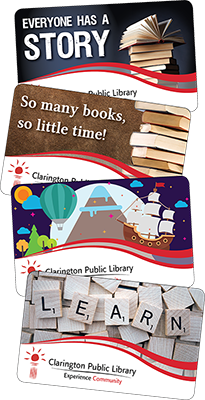 If you lose your card report it immediately by calling Circulation Services at 905-623-7322 x 2709. The fee to replace a lost or stolen card is $2.00 for adults and $1.00 for children (under age 12). Items are overdue by 5 weeks or more. When items are lost or damaged, members will be billed the value of those items plus a $6.00 administrative fee per item. After 45 days overdue, members will be billed the value of all outstanding items, plus the $6.00 administrative fee per item if not already charged. At 60 days overdue, member accounts may be submitted to a retrieval agency and a $15.00 administrative fee will be added to the account.